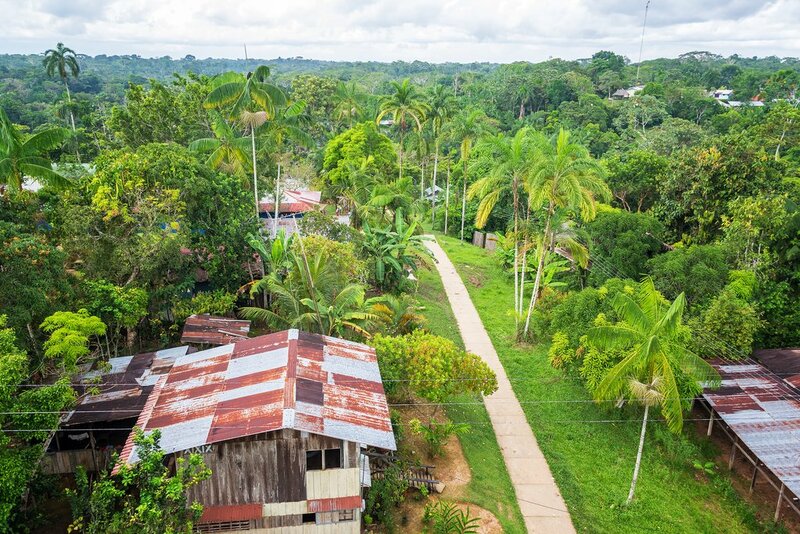 Although Colombia’s Amazonas region is the size of Germany, barely 100,000 people live here: about one-third in and around Leticia, a landlocked river port in the area called Tres Fronteras (Three Borders), where Colombia, Brazil, and Peru come together. The balance of people comprises almost exclusively indigenous tribes living in remote resguardas indígenas (reserves) off-limits to visitors. You can visit several indigenous communities near Leticia. 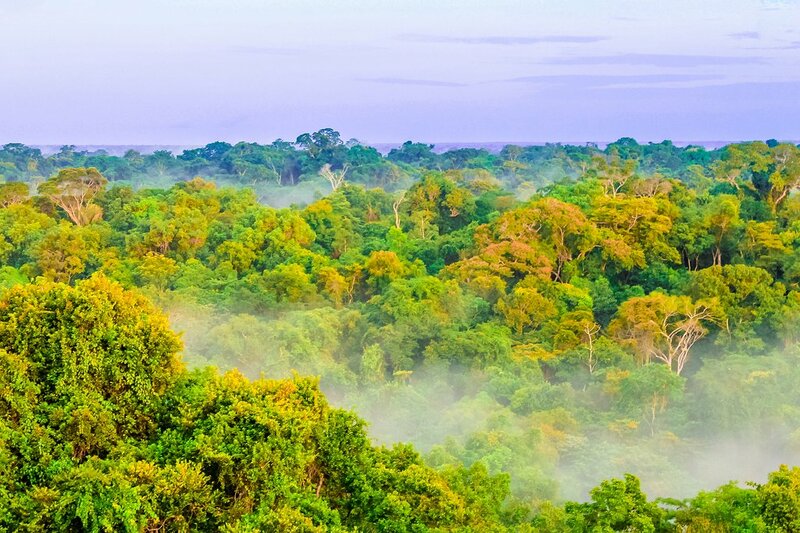 The lush rainforest teems with animal life: As much as two-thirds of all living species on Earth may live here. Many signature species, such as jaguars, are elusive and you’re not likely to see them. But you’re virtually guaranteed to spot a wish-list of animal and bird species — from macaws to monkeys — at national parks and private reserves. Sunset over the rainforest on the outskirts of Leticia. Fly from Bogota to Leticia, the capital of Amazonas province, on the north bank of the Amazon River, in the southeast extreme of the country. Spend your day exploring on foot, the main sites are close together around Parque Santander, the main plaza. For an insight into the culture of the local Ticuna people, visit the Museo Etnográfico del Hombre Amazónico (Ethnographic Museum of Amazonian Man), in the town hall on the park’s southwest corner. Now cross the square to the Catedral de Nuestra Señora de la Paz (Cathedral of Our Lady of Peace) and climb the bell-tower for a bird’s-eye view over the town. Then head to the waterfront to marvel at this hive of commercial activity as dozens of riverboats are loaded and unloaded with cargo. Return to Parque Santander at sunset to witness thousands of small parrots that flock nightly. Leticia has a number of excellent accommodation options for different budgets. 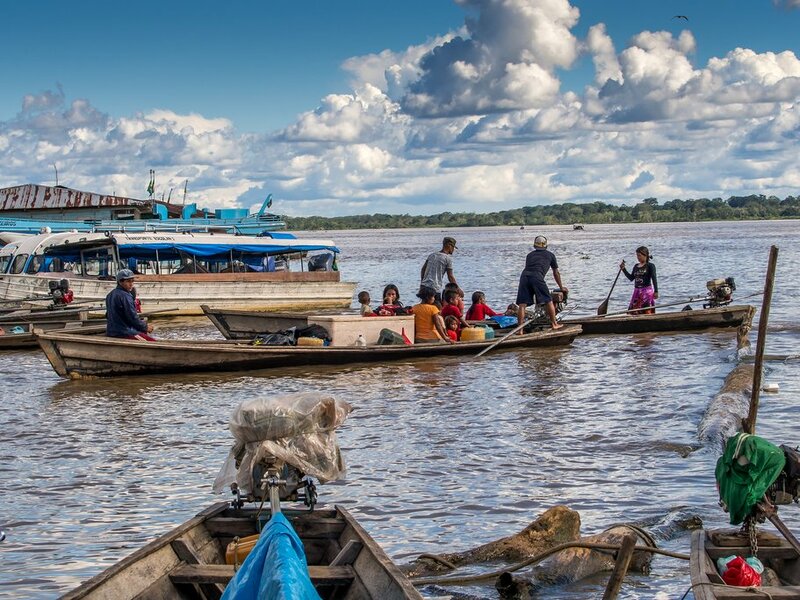 Boats and passengers congregate at the Amazon port near Tabatinga. This morning, take a moto taxi or three-wheeled tuki-tuki to Tabatinga, Leticia’s contiguous sister town in Brazil. It’s an invisible border, without any frontier formalities. You would hardly know you’re in Brazil but for the switch from Spanish to Portuguese. Although Leticia has far more hotels and services, Manaus and Iquitos-bound boats leave from Tabatinga. Seek out a bar-restaurant atop the riverbank and relax as you watch the port activity and river traffic. After lunch, head back to Colombia to visit Parque Ecológico Mundo Amazónico, 4 miles (7 km) north of Leticia. 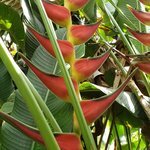 Here you can select various guided tours to learn about the local ecosystems and medicinal plants, view piranhas and other tropical fish and see how local natural products are used to make soap, shampoo, etc. 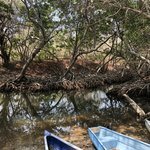 On the cultural tour, you’ll trek through the jungle to Maluca Macuna, where the indigenous community will show you their traditions, including inhaling ground tobacco mixed with lime through the nostrils. 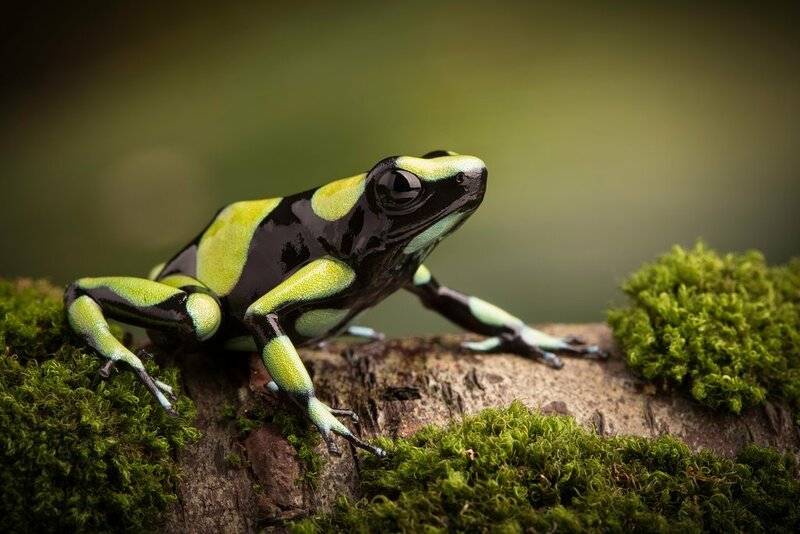 Poison dart frogs can be found in the Reserve Natural Tanimboca, the bright colors warn away predators. Today head to Reserva Natural Tanimboca for a full day and night at this private reserve protecting secondary growth forest. Knowledgeable guides lead nature hikes that hopefully will deliver wild animal sightings. There’s also a display area of poison-dart frogs, snakes, and a blind crocodile. In a good display of eco-sensitivity, the owners return captive reptiles back to the wild every month. Here you’ll ascend by rope (quite a blood-pumping ordeal!) or winch to explore the forest canopy on elevated boardwalks. To get around up here, zip lines run between massive trees. Your visit also includes kayaking on the Río Tacana. After dinner, take a guided night walk through the jungle to appreciate the nocturnal wildlife. Then comes the highlight of your visit: sleeping in the middle of the jungle in a rustic treehouse (with en-suite shower and toilet) about 15 m. (40 ft.) above the ground. This is not for the faint-of-heart, as unseen critters come out to hunt in the treetops — a thrilling experience that guarantees lifetime memories! Squirrel monkeys are a common sight on the Isla de los Micos. Today head upriver. Your boat excursion begins with a visit to Isla de los Micos, a 45-ha. (111 acres) nature reserve 22 miles (35 km) west of Leticia. 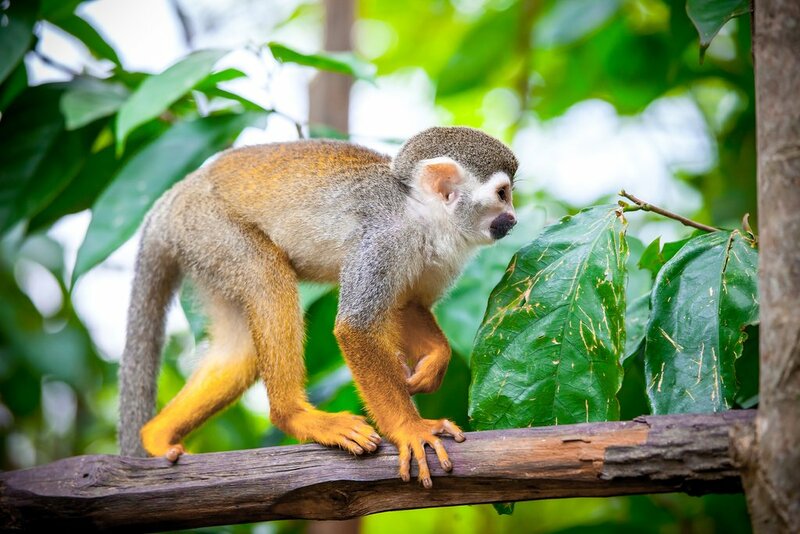 “Micos” is a local nickname for tiny squirrel monkeys, the most numerous of several species of monkeys for which the island reserve is famous. Be prepared to be swarmed! Although living free, the monkeys are very tame and jump onto visitors in search of food. The trails through the forest include elevated boardwalks and viewing platforms, and local indigenous guides explain monkey ecology. Wear clothes you don’t mind getting dirty and remove earrings and spectacles beforehand. You can also paddle a canoe on Lago Tucuchira with stops at Ticuna settlements, where you can watch locals fishing in a traditional manner. Continue upriver a short way to Macedonia, a riverside community of about 800 indigenous Ticuna people. You’ll witness their renowned skill as artisans weaving baskets, tapestries, and dolls from the yanchama bark, and carving palosangre (blood-wood) into exquisite sculptures and bracelets inspired by Ticuna mythology and the biodiversity of the Amazon jungle. Overnight in a log-and-thatch cabin atop stilts at Reserva Natura Park, overlooking the Amazon at Loreto Macagua, 22 miles (53 km) from Leticia. View of the conservation-conscious community of Puerto Nariño. 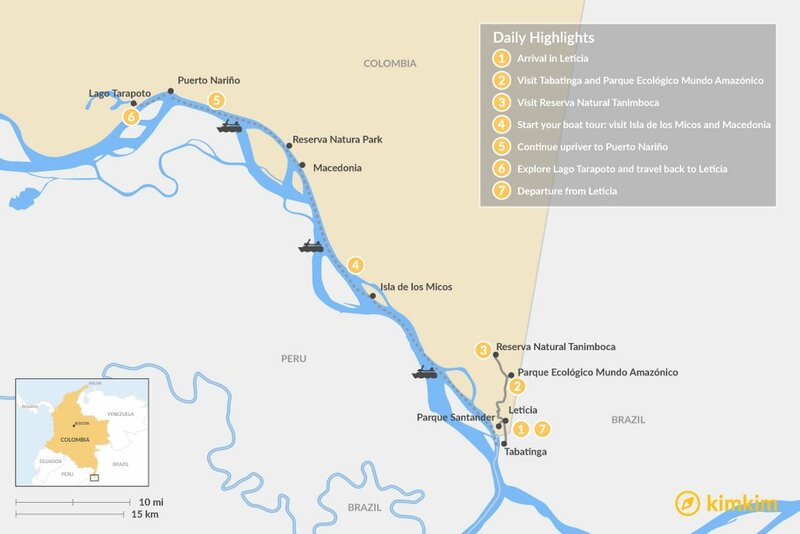 Continue upriver to Puerto Nariño, a well-maintained and conservation-conscious community on the sloping northern bank of the river, within the Reserva Indígena Ticuna. There’s plenty to see and do in the village. Start with Centro Interpretivo Natutama, where creative displays simulate the underwater environment, with life-size manifestations of manatees, the three-meter-long (10 ft.) pirarucú, charapa (the world’s largest freshwater turtle), and river dolphins. Next head to the municipal town hall, housing the Museo Etnográfico Yai Pata Uinchi. This thoughtfully presented museum educates visitors about the culture and customs of the indigenous Ticumi, Cocama, and Yagua people that live in the zone. Now let serendipity guide you along well-paved pathways, and perhaps along the various themed interpretative trails that lead into the jungle. 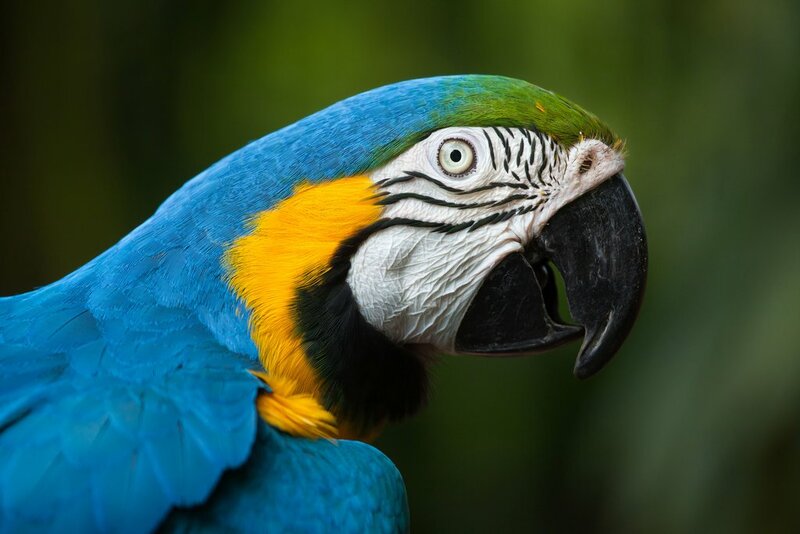 Bird watchers are almost certain to spot macaws at Lago Tarapoto. A highlight of any visit to Amazonas is a sighting of a boto, the mystical pink dolphin. The best place to find them is Lago Tarapoto, about 3 miles (5 km) west of Puerto Nariño. This ox-bow lake is connected to the Amazon proper by the Río Loretoyacu. Local guides will take you in a peque-peque. The lake is usually as calm as a millpond and this is a good place to see giant Victoria amazonica water lilies, and such birds as jacanas, macaws, and camungo (the ‘horned screamer’). 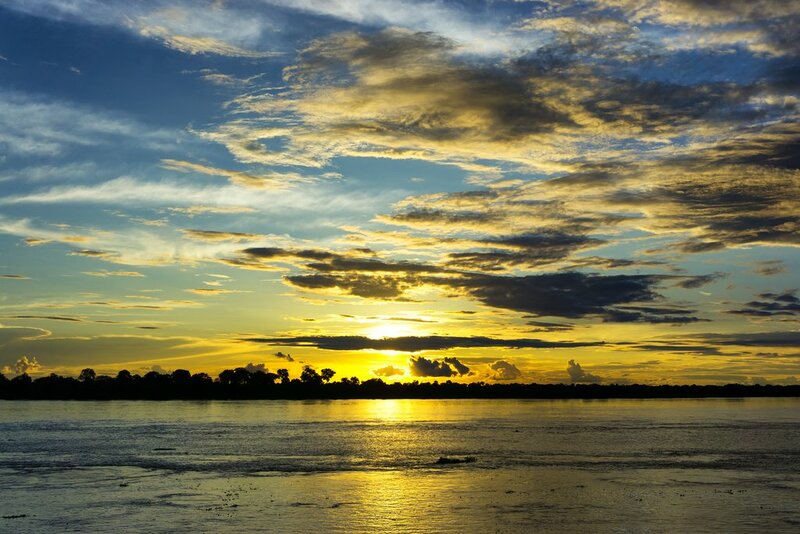 Then, return to Leticia for your final evening in Amazonas. Transfer to Leticia’s airport for your direct flight to Bogotá.